One might well stop reading immediately after running into “our trained analysts” with all that implies, but that would deny the greater pleasure derived from considering news-sites that have “…a hidden agenda or knowingly [publish] falsehoods or propaganda.” Excuse me, but hidden agendas, lies and propaganda are what the mainstream media is all about, note particularly the recent feeding frenzy over the Covington school incident at the Lincoln Memorial. Catholic racist white boys vs. elderly Native American war hero was how the story was framed all over the mainstream media before it became clear that the entire chosen narrative was upside down. Only a couple of news outlets bothered to apologize when the truth became known. Make no mistake, NewsGuard is a neoconservative contrivance which promotes an establishment view of what is true and what is false. Its co-founder Gordon Crovitz (image on the right) is an ex-editor of The Wall Street Journal, who has enthused over the project, saying that it is “a milestone in the fight to bring consumers the information they need to counter false information, misinformation and disinformation online.” Crovitz has also been associated with the leading neocon foundation The American Enterprise Institute while the NewsGuard advisory board includes Tom Ridge, who was head of the Department of Homeland Security under George W. Bush, and Michael Hayden, who directed both the CIA and NSA. It is as government-establishment in orientation as it is possible to be. In a sense seeking to establish “accuracy” in news reporting is nothing new as the social media, to include Facebook and Twitter, have had that objective for some time, but NewsGuard defines itself as having as its target the screening of the entire media in a politically impartial fashion, as “an information resource.” And the real danger is that it will soon be appearing on your computer or phone whether you want it there or not. It is already installed on local library computers in Hawaii and Ohio and is working with university and even high school libraries to include its software on all public computers. Worse still, NewsGuard is in partnership with Microsoft as part of the latter’s Defending Democracy Program. 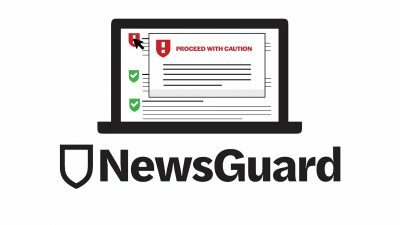 Microsoft currently has NewsGuard on its Edge browser and it intends to install the tool on its Microsoft 10 operating system as a built-in feature. Microsoft 10 is the standard operating system on nearly all computers sold in the United States. The first thing one might observe about the system is that it is designed to favor large, well-funded establishment news sources that are staffed to go through the motions of fact checks and corrections. All of the major news networks are approved, including Fox, MSNBC and CNN, all of which editorialize heavily, almost constantly, in their news coverage. Voice of America, which is a U.S. government propaganda instrument by design, also is approved. NewsGuard also has approved all major newspapers to include The New York Times, which frequently gets the story wrong, and The Washington Post, where news stories are nearly indistinguishable from editorials through the use of evocative headlines and slanted narrative. All the U.S. media currently leadoff, for example, with stories about Russia that include the assertion that the Kremlin interfered in the 2016 election, a claim that has yet to be confirmed through actual evidence. Russian media operating in the U.S. including RT America and Sputnik get red ratings with a warning “Proceed with caution: this website fails to basic standards of accuracy and accountability.” RT is apparently guilty of “repeatedly publishing false content,” “not gather[ing] and publish[ing] information responsibly,” “not handl[ing] the difference between news and opinion responsibly” and “not provid[ing] the names of creators.” Al-Jazeera, another news service that often criticizes the United States and its governmental policies also is rated red, suggesting that the true criterion for rejection by NewsGuard is one’s relationship to the official establishment and globalist/interventionist line being promoted by the United States. A glaring example of NewsGuard’s political bias relates to BuzzFeed, which is an approved site. The Washington Post reported recently how a BuzzFeed story about Michael Cohen and President Trump claimed that the president had directed his lawyer to lie to Congress regarding a proposed office tower project in Moscow, which would have been both a crime and impeachable. A day later Special Counsel Robert Mueller’s office intervened and described the story as untrue. The New York Times ran the first story on page one but the retraction that followed appeared on page 11. And it was not the first major bit of fake news for BuzzFeed. The same two journalists had previously reported that Russia had financed the 2016 election. CNN, another NewsGuard green authority, inevitably bemoaned possible consequences arising from the Cohen-Trump story by complaining that it would be used to justify “bad stereotypes about the news media,” had its own Russiagate misstep when it falsely claimed that Donald Trump Jr had had access to WikiLeaks’ DNC emails before their 2016 publication. The fact is that Jeffrey was completely wrong about developments in Syria, where the government had been extremely successful in re-asserting control over nearly all of the country, while the claims of chemical weapons use have been rebutted many times, including by actual witnesses and journalists on the ground during the alleged attack at Douma in April. Reuters news agency, yet another NewsGuard green light, is also into the game. In November 2013 it published an article, part of a series, entitled “Khamenei controls massive financial empire based on property seizures,” which claimed that an Iranian government charitable foundation called Setad (also known as EIKO) actually exists to take control of property for the use of the government’s religious leadership. A subsequent news report that appeared in January in the alternative media revealed that the investigative journalists who wrote the story did so from Dubai, London and New York and never visited the properties they identified, in most cases completely misrepresenting what could be seen on the ground. Robert Fontina of Counterpunch has also rejected the depiction of Setad as anything but a charitable foundation. The truth is that Setad engages in major social projects, including rural poverty alleviation, empowering women, home and school building, and provision of healthcare. Fontina observes that American sanctions against it and similar entities hit ordinary Iranians’ lives by producing food insecurity while also restricting the supplies of needed medications. Ahmad Noroozi of the Barakat Foundation claims that numerous Iranians have already been affected by U.S.-initiated sanctions directed against his country, restricting access to cancer treatments and other pharmaceuticals. So who gets the endorsement from NewsGuard? Those who toe the line on U.S. policy and the establishment globalist/interventionist agenda. It would be interesting to know what NewsGuard’s staff of analysts is really looking for when it researches a site or media outlet. As the examples cited above demonstrate, NewsGuard has nothing to do with taking pains to report the news accurately, nor is there any evidence of real accountability. It is all about who pays the bills and who is in charge. They give the orders and one either falls in line or goes out the door. That is the reality of today’s mainstream media.